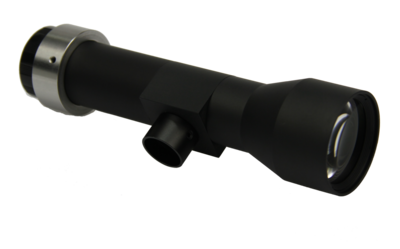 A telecentric c-mount lens is used in applications where high accurate measurements are required. This is because a telecentric lens has almost no image distortion, no magnification changes due to object displacement, no perspective errors and no lens shading. The result is an image, where the objects in the center have the same dimensions and gray values as the objects in the corner of the image. 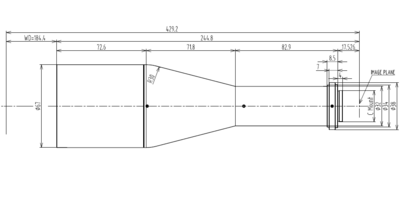 The dimensions of a telecentric lens are always larger than the required Field of View. 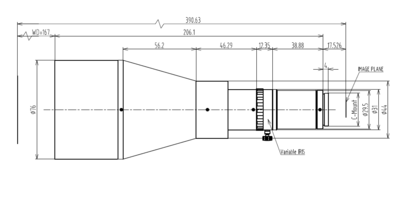 This makes a telecentric lens for large field, very large and expensive. 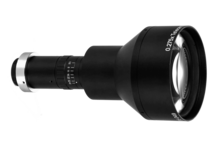 Our telecentric lenses are c-mount. They fit on our standard c-mount machine vision cameras. 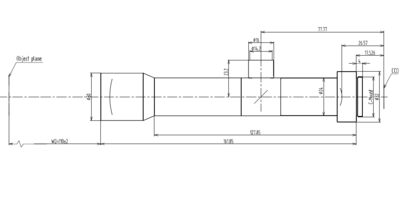 When using the telecentric lens horizontal, the lens needs to have a support bracket, otherwise the tension on the c-mount of the machine vision camera becomes too large. 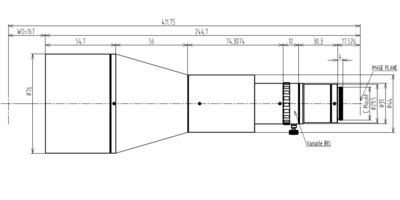 If the lens is mounted vertically, a telecentric lens don’t need a support bracket. 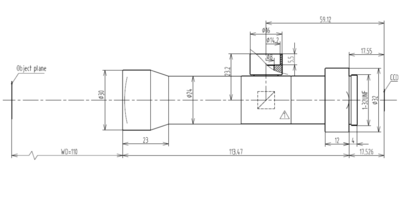 However often the mechanical designer decides to make a mount for the lens to be mounted to the body of the machine instead of fixing the lens on the camera and mounting the camera to the body of the machine. This is because of vibration. Mounting the telecentric lens to the body of the machine will result in a hardware setup where the camera and lens have less vibration, resulting in a sharper image. 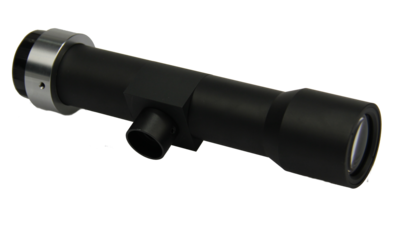 Some of our telecentric lenses have a coaxial light input. When connecting a LED coaxial light, a half transparent mirror inside the telecentric lens will project the light through the lens on the object. It creates an uniform light. LCM-TELECENTRIC-0.367X-WD184-1.3, Telecentric C-mount Lens, magnification 0.367X, sensorsize 4/3"
Telecentric LENS C-mount, Magnification 0.367X, WD184, max sensorsize 4/3"
If you have questions or a specific request concerning a telecentric lens, don’t hesitate to contact us.